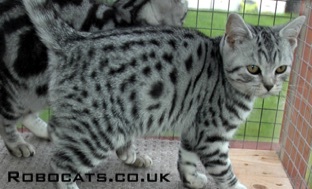 If you are looking for a Silver Tabby or a Silver Spotted kitten - you've come to the right place! 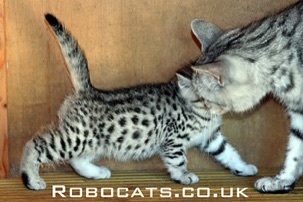 Robocat Silver Tabby & Robocat Silver Spotted British Shorthairs. Born and bred in the Hertfordshire countryside, England. Take a few minutes to enjoy the very best the world has to offer - you will not find these beauties anywhere else. 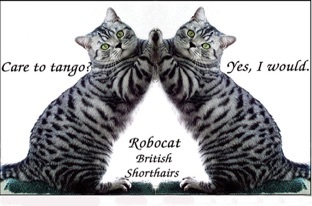 Robocats was founded in 1996 by Allan White. Joined by his wife Lindsay, they produce the most jaw-droppingly gorgeous cats that have found loving homes throughout the world. Looks like a snow leopard, dense black spots on a silver background but with the gentleness of a true lap cat. Silver spotted kittens are occasionally available for sale.